Visit the official website of AIIMS. Click on link specifying "AIIMS MBBS Results". Enter Candidate ID and Password Click on submit button. Result Availability: Candidates can check there result of AIIMS MBBS 2019 from the official website of AIIMS. Result Date: The Candidates can view their result on 18th June 2019. Responsible Authority: All India Institute of Medical Sciences, New Delhi is the responsible authority to release the AIIMS MBBS 2019 results. Result Publication: Candidates who appeared for the entrance exam and obtained minimum qualifying marks, their results will be published on the official website. 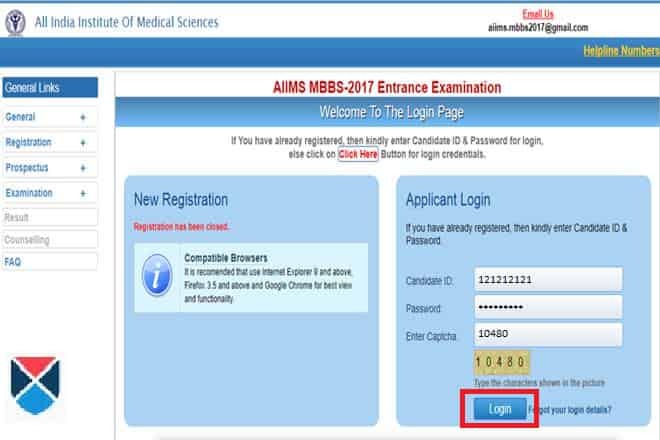 Merit List: The candidates who obtained the minimum qualifying marks can check their rank and the merit list on the results page of the AIIMS official website. Login Details: Candidate can view their results by entering details such as their Name, Roll Number, Category and Father’s Name. Eligible for Counselling: Candidates who secure the minimum qualifying marks gets short-listed in the merit list and is further considered as eligible for AIIMS counselling rounds conducted by the participating institutes. Marking: The result of AIIMS MBBS 2019 is based on the marks scored by the candidates. Candidates will get 1 Mark for every correct answer and will lose 1/3rd Mark for every wrong answer. Ranking Scheme: AIIMS MBBS 2019 All India Rank will be determined by Percentile. Candidate's score obtained in the entrance exam will be converted to Percentile. Counselling will be conducted physically and the call letter of the AIIMS MBBS 2019 Counselling will be released by the AIIMS. Cut Offs of the respective category. 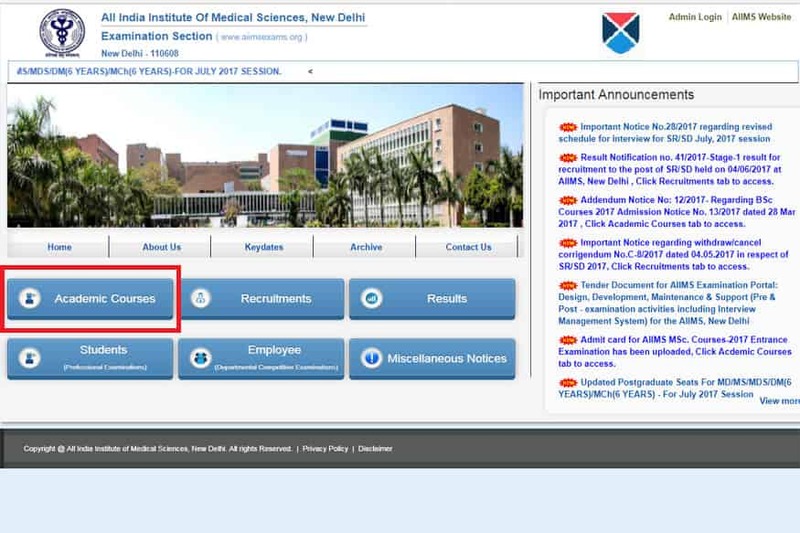 Step 1: Firstly candidates need to go to AIIMS MBBS's Official Website. Click on Academic Courses as shown below. Step 2: The following page will show you where all the courses wiil be available. Select MBBS and it will direct you to the login page as shown below. Step 3: Enter your ID and password. In case you've forgotten your password, click on 'Forgot your login details?'. Step 4: A pop-up will appear. Enter the Candidate ID, mobile number, date of birth, and e-mail ID. Step 5: Enter the captcha code and click Login. Candidates are requested to take the printout of the result and keep it safe till the admission procedure starts for the medical colleges. The scorecard is a crucial document submitted during the time of AIIMS Admission. It has to be produced during the time of counselling. Score and Percentile of Biology. Score and Percentile of Chemistry. Score and Percentile of Physics. Counselling date allotted to the candidate. The overall merit/ranking shall be based on the Percentile scores of the Total Raw Scores. AIIMS MBBS Cutoff will be calculated by taking the candidates minimum score and also the merit percentile cutoff will be included in the counselling merit list prepared by AIIMS, New Delhi. And the same the admissions will be taking on this basis. Biology: Candidates who score Higher Percentile in Biology they will result in higher ranking in the Merit list. Chemistry: If the candidates Biology Percentiles do not break the tie, then the applicants higher Percentile scores in Chemistry will result in higher ranking in the Merit list. Physics: If the candidate's Biology and Chemistry Percentiles also do not break the tie, then the applicant's Percentile scores in Physics will result in higher ranking in the Merit list. Age: If the candidate's marks are not enough to break the tie, then finally the candidate who is elder by age will be ranked higher on the Merit list. What is the method for determining merits of morning and evening shift? The overall merit will be determined by merging of percentiles of total scores of both the shifts, i.e. morning and afternoon. What is the passing percentage for AIIMS MBBS? When will the results for MBBS be declared? The AIIMS MBBS Entrance Exam results will be announced during the middle of the month of the June.